Remember remember the fifth of November: The Anonymous Million Mask March in London in 2013 attracted thousands of protestors. 24:28: #MillionMaskMarch protesters reach the doors of 10 Downing Street. 23:30: Palestinian flags, NHS rants, and anonymous chants; scenes from #MillionMaskMarch in London. Palestinian flag quite prominent at #Anonymous #MillionMaskMarch in #London #UK today. #Gaza #Palestine pic.twitter.com/iqJsPLOyKI"
23:20: Police reportedly clearing out #MillionMaskMarch protesters in London. 23:00: Reports of five people arrested at the #MillionMaskMarch protest in London. 22:40: While there are reports of chaotic scenes in London, #MillionMaskMarch protesters take to the streets in Italy, Sweden and Peru as part of the global protest. "@OperationItaly: #5N #Milano #MMM #MillionMaskMarch #Italy #Anonymous pic.twitter.com/Irzf9D7S7w"
22:00: Reports emerging of protesters "spitting on cars, kicking them and throwing beer cans on car roofs." 21:30: #MillionMaskMarch protesters chanting "Revolution!" 21:10: BBC failing to report on #MillionMaskMarch protests on their doorstep. 21:05: #MillionMaskMarch protesters launch attack on BBC building. 21:00: Scottish #MillionMaskMarch protesters converge at Edinburgh Castle. 20:30: Reports of minor clashes between police and #MillionMaskMarch protesters in London. "@Sara__Firth: Police having some traffic cones thrown at them by protestors on #MillionMaskMarch #London pic.twitter.com/JSW3lMrDYK"
20:10: Police mobilise forces as #MillionMaskMarch protesters continue towards Buckingham Palace. 20:05: Reports of scuffles breaking out between police and #MillionMaskMarch protesters in London. 19:50: #MillionMaskMarch protesters head towards Buckingham Palace. 19:00: Russell Brand makes his appearance at the #MillionMaskMarch in London. London awaits the #MillionMaskMarch Anonymous http://t.co/Yb47UP8QEG pic.twitter.com/8ynkFfPLzA"
17.35: Protests are beginning to gain momentum in a number of European cities, with several hundred reportedly gathered in Amsterdam. 16.45: The Washington march is in full flow, with protestors now walking down Pennsylvania Avenue towards Capitol Hill. A brief stand-off with police outside the FBI building - with chants of "you work for us" - passed without any serious incident. 16.30: Photos are now emerging from protests earlier today in Hong Kong. Anonymous hackers offered their support to Hong Kong pro-democracy protestors last month by leaking government data and shutting down government websites. 15:55: Protesters with masks, flags and banners are gathering outside the White House. They're all chanting "we are the 99%". 15:00: As protesters slowly gather at Trafalgar Square, signs put up by Anonymous members outline their 'Rules of Engagement'. These include: "In the event of police action against protesters, turn around, be silent, pass it on. Give them no sign of aggression." 13.20: The Metropolitan Police has revealed that police in London will have the power to force anyone wearing a mask to take it off, imposing Section 60AA of the Criminal Justice and Public Order Act 1994 across Westminster between 5pm today and 2am tomorrow. 13.05: The Evening Standard has posted this picture from Parliament Square showing preparations for tonight's march. 12.51pm: And looking ahead, here's a livestream to look out for later on in the Netherlands. 12.35pm: Some images from Sydney earlier today. It's getting on to midnight there now and as yet no reports of any major unrest from the sunnier side of the world. 11:20am: There are "hundreds" of riot police officers on stand-by in preparation for tonight's London protest, the Evening Standard is reporting, as steel fences are erected around Parliament Square. The Anonymous UK website calls for as "massive Anonymous blockade of London City. Complete physical gridlock. Only thing that gets through are fire & rescue and ambulances. Nothing else moves." 11:00am: To give an idea of the numbers expect to decend on London's Trafalgar Square this evening, the march has grown from attracting between 500 and 600 Anons in 2011, to 2,000 in 2012 and over 2,500 last year. "This idea is not going away," Anonymous says, as it prepares for its largest London march yet. 10:50am: Also speaking to Russia Today, prominent Anonymous member Old Holborn said "the internet has the power to bring down regimes, that's why it terrifies them...they have no particular jurisdiction over the internet, it belongs to everyone." 10:40am: In a bid to keep the protest peaceful, the Metropolitan Police says it wishes to engage with Anonymous so they can "work together to ensure they can protest safely." Chief Superintendent Pippa Mills said the police force is trying to contact Anonymous, but "no one has come forward." Mills added: "We are keen to talk with them to ensure they are able to protest; it is important that they talk to us so that we can work together to achieve a safe and successful event." But this could well fall on deaf ears, as a notice on the Anonymous UK website states: "Collaborating with the police implicates and endangers anyone who does not know of, or agree with, the state sanctioned plans of the march." 10:10am: In an interview with Russia Today, an Anonymous member said the Million Mask March is "a night of grievance on a night that's historically about parliament and how it's not always working in the people's interests. We burn an effigy of Guy Fawkes on a fire each year as a warning against standing against parliament so we just felt it would be symbolic." 9.35am: The Anonymous Video Network has released this video, saying that in 2014 "Anonymous plans to take civil disobedience to the next level". 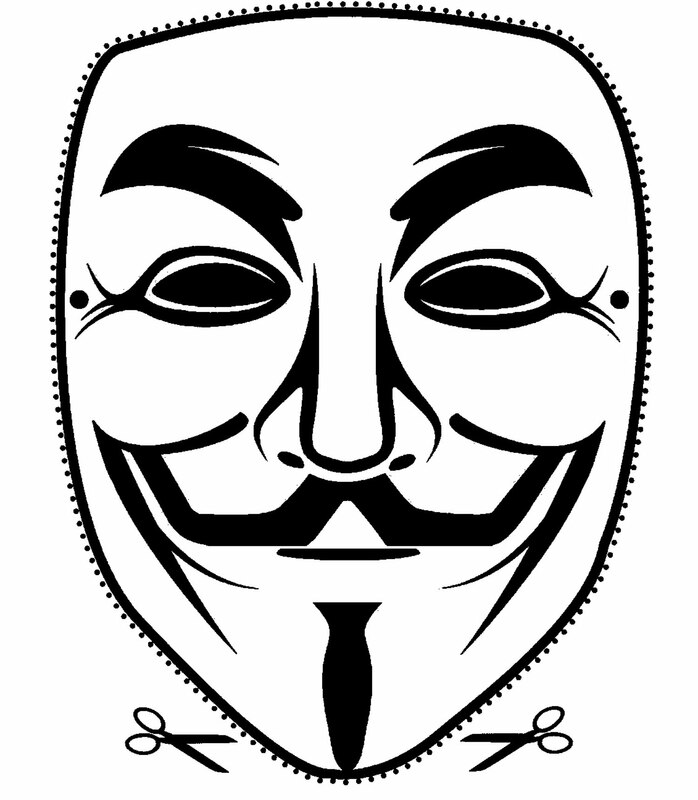 9.01am: And talking of masks, here's an interesting analysis of esoteric iconography used by Anonymous. 8.52am: For anyone wanting to take part in a march but are worried they lack the correct facial accoutrements, someone has created a printable Guy Fawkes mask. No excuses now for any would-be revolutionaries. 8.25am: So what have the hacktivist collective that is Anonymous been up to lately? Here at IBTimes UK we've been following them closely and have several reports from the last few weeks relating to their actions. Click on the hyperlinks to find out more about Israeli government websites being shut down in retaliation to the killing of a 14-year-old, Atlantic Records being forced to release Lup Fiasco's album, and how Chinese government data was leaked in support of pro-democracy protestors in Hong Kong. 7.00am: There are also reports coming in from Sydney, Melbource, Tokyo and beyond though specific numbers are at the moment hard to come by. Some people will be live-streaming the protests with a collection of links available here. 6.30am: The second annual Million Mask March is well under way with Anonymous protestors in countries like New Zealand, Australia and Japan already meeting to protest. Anonymous is once again taking to the streets today, 5 November, in what is the second annual Million Mask March. The first march is due to kick off in Auckland in New Zealand at midday local time and will continue throughout the day and across the globe in almost 500 towns and cities. The group is protesting "to shed light on corrupt government in order to set people free from oppression". Protest marches are set to take place in locations around the globe as diverse as London, Kampala and even Antartica. If you are wondering if there will be a march in your area you can check out this map.